Our new English translation of Otogizōshi: The Fairy Tale Book of Dazai Osamu, has had an interesting life. While I can't reveal all the sordid details of its conception and birth, I thought a brief rundown might be pretty interesting. In late 2008 I decided to contact Ralph McCarthy, who has published a wide range of translations by Japanese authors. I was especially interested in two books he had done by Dazai, Self Portraits and Blue Bamboo, which were published by Kodansha International years ago and have been out of print for a long time. It was the 100th anniversary of Dazai's death, and issuing a Dazai book was an intriguing idea. The first step, of course, was finding him! As it turned out, several of the translators I work with knew him on a first-name basis, and they were able to hook me up very quickly. I sent him an email, and discovered that he was pretty intrigued with the idea, too. And since he owns the copyrights to both books, I figured it was going to be pretty simple. The next month, January 2009, I contacted Kodansha International to make sure the rights had reverted to Ralph. (Dazai is very dead, and all his Japanese is now in public domain.) It took a phone call or three to get to the right person, and she very promptly investigated, returned my call the very next day: "The book isn't out of print yet," she told me. That struck me as a bit strange, considering it isn't available anywhere and is marked "Unavailable. Out of print" on several sites, like Amazon. I asked if they had copies for sale. Well, how can it still be in print? "We haven't classified it as out of print yet. We may decide to reprint it." I found out who was next in line above her, and sent a few emails to him. That was January 20, 2009. He responded very promptly and said he'd look into it. A few reminders later, and I had my answer on March 12 (still the same year, though!). I was welcome to reprint Blue Bamboo if I liked, but not Self Portrait; they were thinking about re-issuing it themselves, possibly as an ebook or POD. By this time, being somewhat fed up with their (lack of) reaction, Ralph and I had moved on. He was translating a number of Dazai's stories that had never been put into English before, and one of those was Otogizōshi. We decided that Otogizōshi by itself, although not very long, would make a good book and introduce a relatively unknown side of Dazai to the English literary world. Then we started talking about the cover. Years and years ago, Ralph also translated a few Japanese fairy tales, including Momotarō, into English for Kodansha. The fairy tale series was a big project for Kodansha, done in beautiful editions with stunning covers by top-notch Japanese artists. He was especially enamored of a cover by Yonai Suihō (米内穂豊). For reasons I can't go into, the rights holder declined, as did the rights holder for our number two choice, a nice Urashima Tarō illustration by Kasamatsu Shirō (笠松紫浪). Meanwhile, life goes on. Ralph completes the translations, and sends them in for checking. There are a few points to talk about, and things to research. We start looking around for someone in the field to write an introduction, and write a letter outlining our goals to Joel Cohn, who has written a piece about Dazai in an old issue of Monumenta Nipponica, and seemed to have a good understanding of the aspects of Dazai we were trying to illustrate. In the space of a few days, we had made contact and reached an agreement. Extremely smooth communication, no doubt because everyone involved really wants to see this book out in English! In the process of checking the translation, we notice a paragraph in "Click-Clack Mountain" where Dazai starts talking about the pernicious influence of a certain type of movie. The paperback we have been using as the source is a fairly recent edition, and has Dazai talking about something called "JAZZ EIGA." This struck us as a bit bizarre, so we checked the original text on Aozora Bunko, discovering that Dazai actually said "AMERIKA EIGA." Could this represent some sort of censorship by the Occupation Forces? It's possible, but who knows? Another interesting question was what movie he might have meant by "スキイでランラン" (Ski de ranran). We went with "Heartthrobs on Skis" to start, and had pretty much given up on ever figuring out what film he might be referring to when Joel Cohn suggested that it was probably this Hungarian film. It sure looks right, but whether Dazai meant this film, and if so what language he saw it in, remain a mystery. Around the end of 2010, the translations to Otogizōshi are done, and sent off to the copyeditor. February 3, 2011. The copyedited manuscript is back. I check through it, add a few cryptic comments, and send it off to Ralph for his blessing. Well, how about a photo of Dazai for the cover? Ralph suggests a nice shot of Dazai and his two daughters, taken from Dazai Osamu, number 19 in the Nippon Bungaku Arubamu series from Shinchōsha. I contact the rights department there, tell them which photo and which book I want, and they say they'll look into it. Next day they call and tell me to contact a planning firm in Tokyo, which in turn tells me that the image in question is owned by one of the girls in the picture: Dazai's daughter. They give me her contact information, and we ask. Sorry, she says, it's a personal picture and I really don't want it plastered all over a book cover. OK, back to the drawing board. How about this picture for the cover, Ralph suggests? He found it in an old copy of Japanese Mythology by Juliet Piggott. It's a pretty scruffy image, especially the black-and-white shot I get via email, but a little work on the Internet reveals that it's actually by Edmund Dulac. Unquestionably a beautiful work, and almost certainly available, but we decide against it because it's not by a Japanese artist. I spend several days on the Internet, especially with Google Images, looking at lots of pretty pictures, and finally discover the print by Yoshitoshi on a Russian site. Well, that's a nice picture, we agree. A Yoshitoshi woodblock means the original is out of copyright, but we still have to find someone who has a photograph or scan we can use legally. I head back to Google and begin searching for more information on the print. I telephone a little shop in Tokyo's Jimbocho that specializes in woodblock prints, and see if they have a copy, or know someone who owns one. Nope, they know which print I mean, but can't help this time. Drat. Back to the Internet. 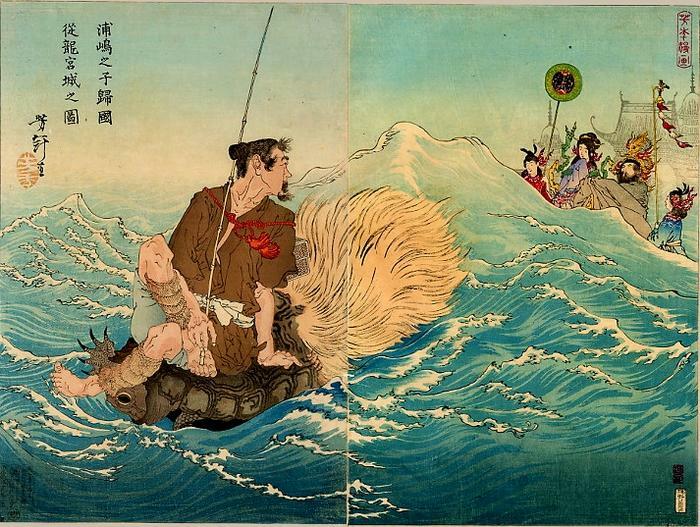 Turns out it was part of an exhibition on fishing in ukiyo-e, held at the Umi-no-Mieru Art Museum in Hiroshima, in 2009. I pick up the phone and talk to a curator there, who advises me it was a traveling exhibition originating in the Seto City Art Museum. The curator in Seto lets me know that they don't own it, it was actually loaned to them by a private collector who often helps them out. They give me the collector's telephone number, and we talk.... turns out he doesn't own it, either, but he borrowed it from the man who does. "Fax up the details," he says, "and I'll be happy to let you know." I fax them up, and the next day everything is all settled. He sends high-resolution scans by E-mail (7.5MB each...), I find out how he wants them edited, and I hand the images off to the designer to think about. And from there on just about everything was quick and simple!